Yasmin Young, a member of the Buffalo Police Advisory Committee, addresses a community meeting Tuesday night at the Frank E. Merriweather, Jr. Library. Photo by Cathleen Draper. The first question asked at Tuesday’s Buffalo Police Advisory Board meeting came from a concerned citizen who said, at 71, he’d been voicing his concerns for a long time, but nobody has been listening. “Where is this going?” he asked. His question was echoed by other community members. By the end of the meeting, it remained unanswered. City residents gathered at Frank E. Merriweather, Jr. Library to voice their opinions on Buffalo police and offer suggestions for how the police can improve their work and their relationships with those they serve. City officials agreed to create the citizen advisory board last September after hearing growing concerns regarding the transparency, accountability and conduct of Buffalo police officers. The board reports to the Police Oversight Committee, which Niagara District Councilman Daniel Rivera chairs. Over 50 citizens applied to become members. The 11-member board will feature three subcommittees: community engagement, policy, and accountability. Only seven members appeared at Tuesday’s meeting. Common Council President Darius Pridgen arrived late and left early. Rivera, who cared enough to create a middleman to listen, did not care enough to attend. Multiple citizens called for greater police presence in the community, and not just through patrolling the streets. Rather, they are looking for community-focused police work. “We are using so many resources to put into the police to occupy neighborhoods and pull people over for small infractions, and that’s time that could be spent building meaningful relationships and actually solving crime,” said India Walton, an organizer for Open Buffalo. Walton wishes to see a residency requirement for police officers, where officers who work in specific neighborhoods must also live there. Others suggested community officers visit schools and build connections with students in an effort to develop better relationships between police and youth. Attendees further suggested better training, resources to increase accountability—like body cameras—and greater consequences for cops who murder a civilian on the job, such as leave without pay or removal from their position. Tanya Delk, who grew up in the Masten area, believes cops need better training in speaking respectfully to crime witnesses or families of victims. Beyond police-community relations, community members feel police are doing nothing to solve and prevent crime in the neighborhoods they serve. Citizens expressed frustration regarding city-installed surveillance cameras. Many said they aren’t effective enough to solve crime or hold cops accountable. “I’m tired of living like that,” said Willie Green, vice president of the Stop the Violence Coalition, referring to keeping bars on the windows of homes and constantly looking over his shoulder while walking. Green worries for the safety of his children, grandchildren and great-grandchildren. So does Delk. They also worry for their own safety in their neighborhoods. And, they feel kids are either becoming immune to the crime and to seeing dead bodies on the streets, or the opposite: traumatized and unable to cope. Questions arose regarding the board’s ability to actually make a positive change in their communities. And, resident concerns were justified. The board is simply advisory, where members will conduct meetings, and then research and propose policy recommendations to the committee on how to improve policing in Buffalo. The Police Oversight Committee meets twice a year, which doesn’t leave ample time to resolve pressing community issues and address the needs of concerned citizens. And, meetings are typically scheduled in the morning hours on weekdays, which prohibits working members of the public from having their voices heard. Tuesday night’s advisory board meeting is the first of three scheduled in the next month before the Police Oversight Committee meeting on September 18. The meetings were coincidentally scheduled to begin in the midst of a high-profile police brutality trial nine years in the making. The defendant Detective Raymond Krug allegedly shot Donald Silmon, a teenager at the time, twice with a BB Gun while he was handcuffed in the back of a police car while Officer Joseph Wendel, the other defendant, encouraged him. The civil rights trial will determine if Krug and Wendel, both white, used excessive force against Silmon and three other black teenagers during their arrests in May 2009. Retired Buffalo police lieutenant Gregory Kwiatkowski will testify against Krug and Wendel as part of a plea deal after admitting to wrapping his hands around Silmon’s neck the same night. The board is yet another method of placating citizens who are unable to walk comfortably in their own neighborhoods or sit on their porches in the evening, or who fear their sons will one day be shot dead while unarmed, with their back turned to the white officer who murders them. Intent, attendees agreed, is something the Buffalo Police Department and city government lacks. “If they haven’t done it, they’re not going to do it,” said Dr. Willy Underwood, a urologist at Roswell Park and city resident. Boards and meetings focused on “listening” are a facade give residents false hope that something will change. But, it never does. “I’d love my grandchildren, I’d love my children and I’d love my mother to be able to walk the street without being gunned down,” said Delk. Delk’s boyfriend was murdered on the corner of Sycamore and Fox in 1993. His killing remains unsolved. Today, she doesn’t let her granddaughter walk to the corner store and barely allows her to sit on the front porch out of fear. Community members like Delk want action. They want leaders with intent to find and enact solutions. Or, attendees said, they’ll simply vote them out of office. Delk and others expressed appreciation to the board members for volunteering their time to listen. And, many acknowledged that not every police officer contributes to the problem. 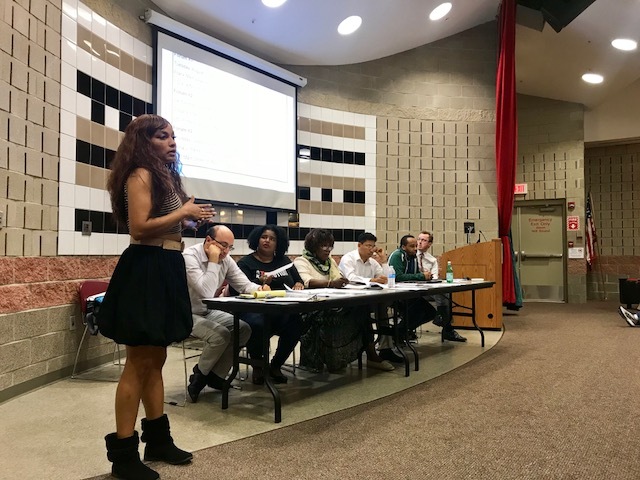 She showed dismay that the crowd was small compared to her expectations, but she knows there must be a point where the board and community meet in the middle.